January 27th marked the date for this event. 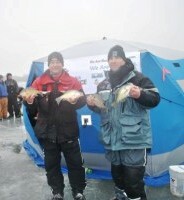 It was a partner tournament, and once again I teamed up with Mark Anderson from Pleasant Hill. We were in the same event two years ago and place 6 out of about 30 teams. We were hoping to do better this year, and we sure did. Things were quite busy for me the weekend before the tournament, and when I did get to the lake to check things out, my auger rope recoil broke before I could even drill one hole. Pre-fishing for me was not in the cards. Mark spent several hours on the lake checking known areas, and areas that are not common to most folks. 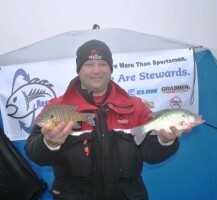 He found several areas that were holding good bluegills and crappies, we were optimistic before the event. We made it to our fist spot and we immediately started filling our buckets with gills and crappies. The final weigh-in had each team weigh their best 5 bluegills and their best 5 crappies. We knew we needed some good sized fish of both varieties. The second spot was a total bust, a few small gills and we were off to spot number three. We upgraded a few crappies and a gill or two in this area, and we were feeling good about he fish we had to weigh-in. One more stop a little closer to the weigh-in would close out our day. We caught some fish there, but nothing to upgrade our 10 fish. When the scales were closed Mark and I ended up in 2nd place for the event, we both were happy and glad that our teamwork, and willingness to move to several areas to get those fish we needed. We fished areas that were almost 40 feet deep, and areas that were as shallow as 6 feet to catch our total weight, which was 6.20 pounds for 10 fish. A great weight for any lake in the state of Iowa. A great day fishing, and top placing...it is hard to beat that. The TV show is done, and it turned out great! Steve Muntz and his crew at McTV did a great job. I hope you enjoy the show and learn a little bit about why I LOVE this sport of ice fishing! The episode will also air on January 29th, 31st, February 5th and 7th on Channel 85 in the Marshalltown area at 7pm each night. The producer of the local cable TV channel sent me this short clip of some of the footage that will be used on the upcoming show. 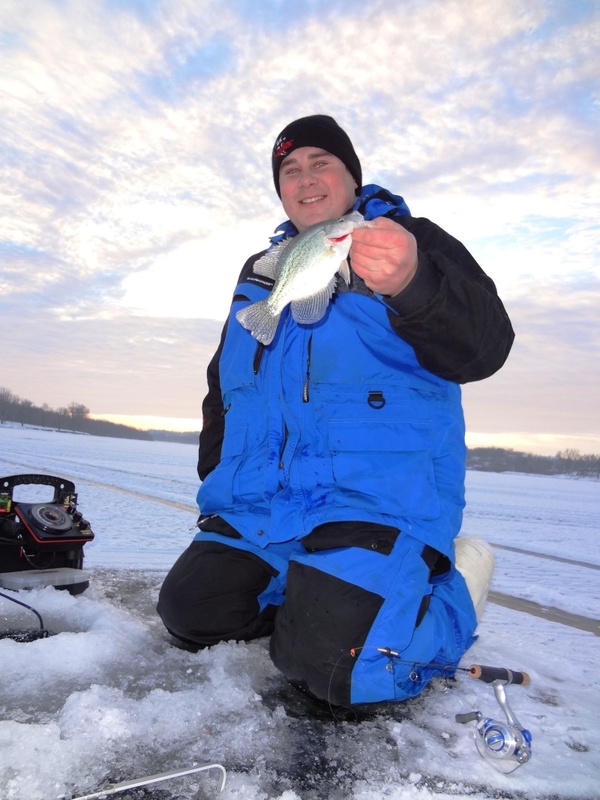 This past Saturday I had a chance to meet McTV producer on the ice to hopefully film an ice fishing TV show. I say hopefully, because the few days prior to the taping session, the weather seemed more like April, and not like January. Temperatures were in the 40's and a day in the 50's the week prior. Then, to make things even more uneasy, a huge cold front came in Friday night, crashing temperatures to the teens and bringing in a 20mph wind out of the west. Needless to say, I did not get much sleep Friday night in anticipation of the filming show. I choose Rock Creek Lake to get some ice fishing on film. I hit the lake the previous weekend, but did not have time to check it out during the week as I hoped. The week prior two of my buddies and I found fish in several locations on Rock Creek Lake, but we ended up fishing the deeper basins of the lake, because we found some roaming schools of bluegills and crappies. We had a blast the previous weekend, and I was just hoping for a fraction of that success this weekend. Well, the warm weather, melting snow, and high winds didn't affect the fish, they were pretty much in the same location, but they did actually move a little bit deeper. Chad Pietig ended up fishing with me for the TV show, this being his first time fishing in front of a camera. I could tell he was a bit nervous on that account, let alone the weird weather we were having. My nerves were calmed when i saw several fish on the Vexilar, telling me that the schools were still using this area to feed. A few seconds into taping, and we had caught our first fish on tape...after that it was just a FUN day of fishing...all that worrying for nothing! Chad and I had a great day at Rock Creek Lake, and now all we have to do is wait of the producer, and his editing staff to come up with an educational, fun and fishing catching TV show. Stay tuned here for further details on air times and YouTube links. 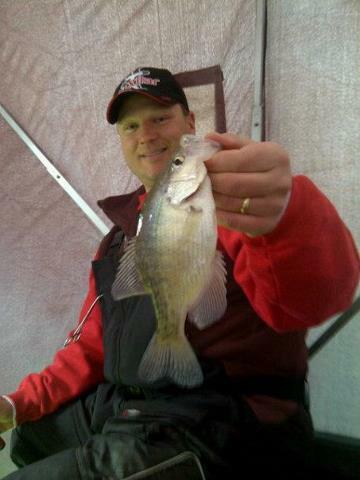 Brian with a keeper crappie off the ledge. Rock Creek Lake is located about 20 miles south of Marshalltown, making it a lake I frequent in the winter time. It is a large lake...for Iowa anyway, being over 400 acres. This allows me and friends to run our snowmobiles all over the lake chasing bluegills and crappies. David Bowles and Brian Bowles joined me on this day to do that very ting, chase down some panfish. I really missed Rock Creek Lake, as the ice never made it safe to ice fish last year, so I was counting down the days when i could once again fly down the lake to my next GPS way point. We started off fishing a brushpile in about 8 feet of water, and quickly we caught a couple bluegills. A few minutes later, off to another brushpile, this time a bit deeper in 12 feet of water. 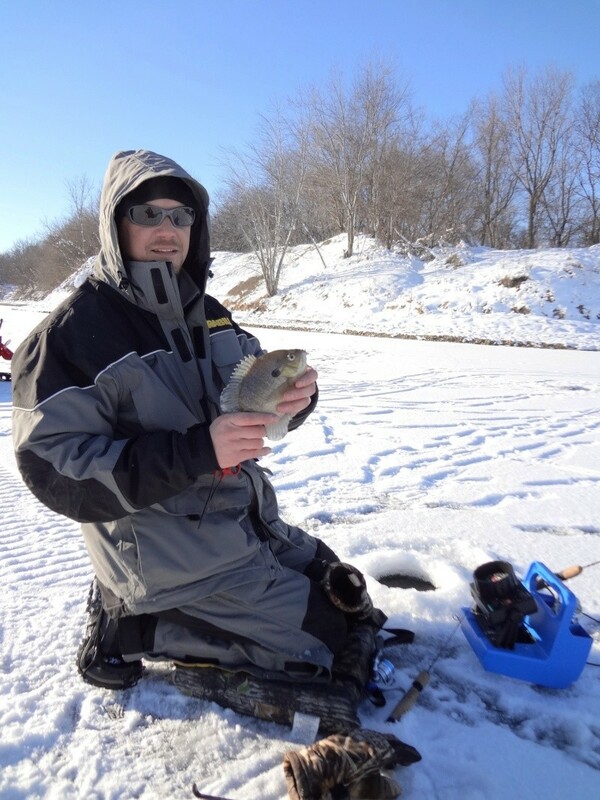 Here we did much better, putting about 25 bluegills on the ice, a few in the 7-9 inch range. The action cooled off quickly, so it was time to try something different. At Rock Creek Lake, you either fish brushpiles, the old channel, or the drop-off ledges. I quickly turned the snowmobile towards my favorite ledge and we were there in no time. Well, so was someone else, so off to ledge #2. 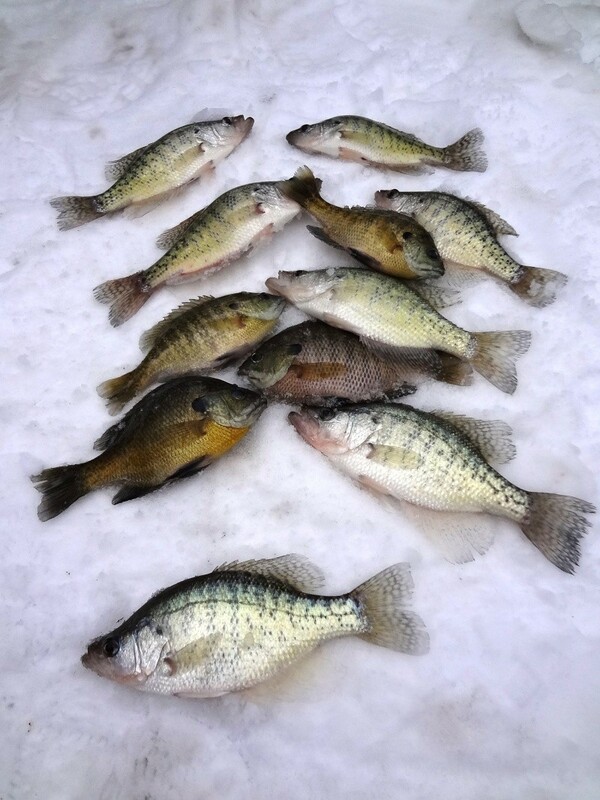 We quickly drilled 20-30 holes and started fishing, catching some nice bluegills and a few crappies mixed in too. While we were doing this, the person that was near my first choice packed up and left. Once again, the action cooled off, and we were on my first ledge in a few minutes. ﻿﻿This is where a good day of ice fishing turned into one we won't forget for a long time, for the next 2+ hours we pulled countless fish through the ice. Big school of bluegills and crappies would swim under us and we would pick them off as fast as you could. The schools would move a little, and so would we. It was amazing to see the Vexilar work as well as it did. Finding the school of fish was easy, and then it was all about the catching. My friends took home 45 keepers that day, about half bluegills and half crappies, and Brian even scored a nice walleye to take home. We threw back at least three times that many fish to swim another day. The long wait of ice fishing at Rock Creek was over, and it was nothing less than a fantastic trip. Each year I have the opportunity to fish some great private fishing locations. New Years Day brought me to one of these areas. Bluegills, Crappies and Bass are the targets at this pond, and all three were to be had this day. Chad Pietig with one of the 9+ inch gills on the day. I took Chad Pietig and Mark Anderson along today, and we all had a great time. Fish were coming through the ice pretty rapidly, and when they didn't we didn't hesitate to move and fish another location. In total we fished five different locations, with about 20-25 holes drilled at each area. The fishing was good, but it took a lot of work, and you had to keep moving to catch fish. We covered shallow water of 4 feet, all the way to about 18 feet of water. All locations held fish, but a few were top-notch for the day that took most of our time. It was all about location, as the fish would hit plastics, spikes, and waxworms. The total: CRAPPIE- about 30, most in the 9-11 inch mark. BASS- about a dozen from 14 inches to about 18inches. BLUEGILL- estimated at about 80, a lot were small, two areas you could literally catch a 4 inch bluegill on every drop down the hole. However, a lot of gills measured past the 9-inch mark, and Anderson just missed out on a "true-pounder", as his biggest gill went 14.6 ounces. This place has "pounders", caught and measured, so perhaps Mark will get his one day too.